Entering the Bundesliga, life for Leipzig couldn’t have been easy. Widely labeled the most hated team in all of Germany, Leipzig made their Bundesliga bow this season, and what an entrance it was. The side stormed into second place leaving established giants like Dortmund, Schalke, and Leverkusen far behind. Key to this astounding success has been their energetic team, driven by the irrepressible Naby Keita. The 22-year-old Guinean was initially brought into the side as a defensive midfielder, but his energy and ability to be a master of all trades meant that Ralph Hassenhutl got some added protection in defence and a boost in attack. The midfield dynamo is perhaps the most important player in this Leipzig side, controlling the tactics & tempo of a young side that more than found it’s feet in the top division. He’s proven his versatility too, at times covering for the creative head Emil Forsberg when he was suspended (and did a fine job of that too). Keita will be crucial for Leipzig next season as they look to keep up their fine run, and contend with the pressures of European competition as well. The midfielder has been ever-present this season, and his consistency is the sort that will be very difficult to replicate. Keïta’s versatility to play in a range of central midfield and attacking midfield positions will be an asset to RB Leipzig. He can play in any of the three attacking midfield positions and although he may favour his right foot, he is certainly akin to using his left with relative ease. At Leipzig, he will no longer be in a squad which is expected to dominate possession (unlike his previous club), however, with his fast passing and movement, a transition to a counter-attacking style of play should be incorporated into his overall game smoothly. 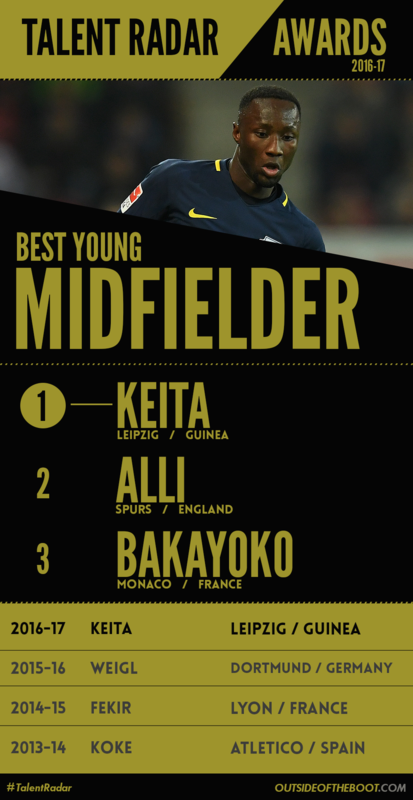 Read a full Scout Report on Keita here.